I never thought of favourite flowers defined by colour. But come to think of it, I love pink flowers. Very interesting perspective. Yellow flowers definitely bring a feeling of sunshine and cheer all around. 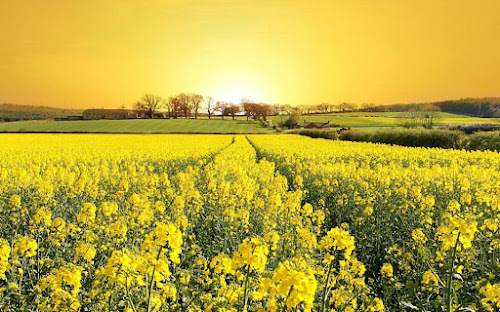 Imagine a field of yellow mustard flowers.... just the image brings a sense of joy. I like all flowers but if I were to pick some favourites I would pick - champa, parijat and madhumalti. I love the parijata flowers..the tiny white flowers with bright orange stalk, and they smell so divine. they just fall off the tree with a gentle breeze.early morning you will find hundreds of them on the ground, fresh and fragrant. I think I dont have any favorites among flowers. Pleasant smelling, fresh and beautiful colours appeal to me. Suzy, my sister also loves pink flowers. That's the color I buy for her when I get her flowers. Exactly, Beloo. There is so much warmth around them! Champa, parijat and madhumalti... these are all flowers with beautiful fragrances, aren't they? LOL! Yes, Raji... it sure does seem to have a smiley face, doesn't it? Yeah, maybe one day I will. Oh right! Now I remember parijat! You're right, Princess! They did smell good. I last saw them when I used to live in Kanpur. Strewn all over the ground in hundreds! That's also a simple and uncomplicated outlook, Shilpa! I love most flowers but my favorites are the pleasant smelling ones like the raat ki rani, mogra, harsingar etc. I like tulips! The maroon ones? But recently I've taken a fancy for pink ones..
Hey I like raat ki rani and mogra too, Rachna. Don't know which one is harsingar. Pink tulips should look very pretty, Mithila. I like yellow tulips. I have a lot of wallpapers with tulips. Got them from webshots. They're just beautiful. Yellow is such a cheerful colour. Once I remember I bought a yellow dress while I was down in the dumps and it cheered me up like little else. As for flowers I like all of them. How can anyone not like a flower? That's true, Tulika. Yellow is a cheerful color.